A campaign to raise political awareness of the £283 million annual contribution that the hair and beauty sector makes to the Welsh economy has moved to Westminster. Shirley Davis-Fox, MBE, the Hair and Barber Council’s political lobbyist and board member for Wales, held a breakfast meeting with eight Welsh MPs on March 21 to discuss the findings of an economic impact assessment report on the sector. The report was commissioned by Mrs Davis-Fox’s business, Bridgend-based ISA Training, the largest independent hair and beauty training provider in Wales, to get the hard facts and evidence about the importance of the sector to Wales. ISA Training launched the report at a reception held at the Senedd in Cardiff, which was attended by Assembly Members and sector representatives last December. The report breaks down the sector’s impact to constituency level, so that MPs can see how many hair and beauty businesses they have in their area and how many jobs are provided. 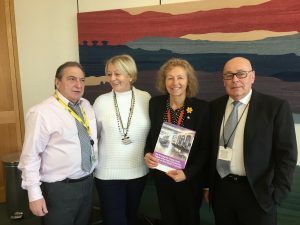 “The breakfast briefing was highly commended by all the MPs who also welcomed this publication saying it was long overdue,” said Mrs Davis-Fox. “The MPs were so impressed by the report that they have offered to co-support any future activity that we hold at Westminster. “I am going to write to all the Welsh MPs that didn’t attend to offer to meet them when I am next in London. It’s important that they understand the impact and value of the hair and beauty sector on the Welsh economy and on their own constituencies. “It contributes £283 million a year to the economy, which is two thirds of the contribution made by fisheries and agriculture. “With 2,418 businesses employing almost 11,000 people, the sector is a key employer and, unlike many service and retail sectors, it guarantees that money earned in a locality is spent and retained in Wales. The MPs who attended the meeting were John McNally, chairman of the All Party Parliamentary Group for Hairdressing, Christina Rees, MP for Neath and Shadow Secretary of State for Wales, Liz Saville-Roberts, MP for Dwyfor Meirionnydd, David Hanson, MP for Delyn, Chris Elmore, MP for Ogmore, Mark Tami, MP for Alyn and Deeside, Jessica Morden, MP for Newport and Ian Lucas, MP for Wrexham. There are calls for similar economic impact assessments to be carried out in Scotland, Northern Ireland and England. Following the report’s launch in the Senedd, Mrs Davis Fox has met with the three Regional Skills Partnerships in Wales and Careers Wales. “We need to ensure that the Welsh and Westminster Governments and other organisations involved in learning and careers understand that hair and beauty is a major part of the foundation economy and keep our high streets alive,” added Mrs Davis-Fox.